With the advent of eBooks, many people have predicted that readers will begin gravitating to smaller works of fiction – short stories or novellas. However, epic novels are still being written and published. 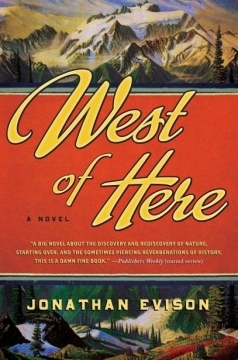 Algonquin Books just published Jonathan Evison’s epic novel – West Of Here and early reviews have been effusive. Set in the fictional town of Port Bonita, on Washington State’s rugged Pacific coast, West of Here is propelled by a story that both re-creates and celebrates the American experience—it is storytelling on the grandest scale. With one segment of the narrative focused on the town’s founders circa 1890 and another showing the lives of their descendants in 2006, the novel develops as a kind of conversation between two epochs, one rushing blindly toward the future and the other struggling to undo the damage of the past. An exposition on the effects of time, on how something said or done in one generation keeps echoing through all the years that follow, and how mistakes keep happening and people keep on trying to be strong and brave and, most important, just and right, West of Here harks back to the work of such masters of Americana as Bret Harte, Edna Ferber, and Larry McMurtry, writers whose fiction turned history into myth and myth into a nation’s shared experience. It is a bold novel by a writer destined to become a major force in American literature. “‘Epic’ is yet another one of those words that’s been stripped of its meaning from overuse, but no other word can properly describe this novel. I’m in awe. You will be, too.” —Ron Currie Jr., author of Everything Matters! via To Be Read – West of Here.